This connection involves a HD satellite receiver, HDTV, Blu-ray Home Theater, Xbox 360. 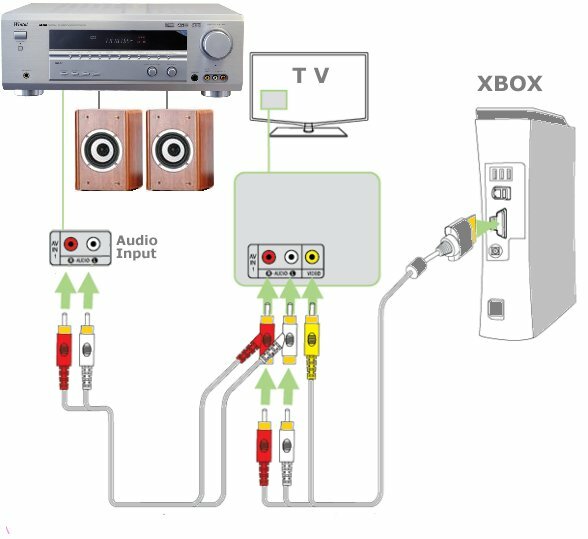 Surround sound from Xbox to Home Theater connects via an optical audio (Toslink) cable. o RF coaxial cables (RG-6). Digital Satellite TV service is used to receive TV signals. 1. Connect a HDMI cable from Sat receiver HDMI out to HDTV HDMI input. 2. Connect a HDMI cable from HTIB HDMI out to HDTV HDMI input. 3. Connect a coaxial RF cable from Sat receiver RF out to secondary (remote) standard definition TV in another room. 4. Connect a Xbox 360 A/V component video cable from Xbox A/V out to HDTV component video input. 5. Connect optical digital audio cable via xbox A/V cable to optical digital audio input on HTIB. o To view TV shows from satellite. o To view Blu-ray movies and listen to surround sound thru loudspeakers. Select proper input on HDTV and select on the HTIB function for xbox360 surround sound. If Home Theater in a box only has a single digital audio input and you want to hear surround sound from satellite receiver, get a switch box with at least two optical inputs and one output. Question: My TV has only a round silver input jack, no yellow, white, red inputs. How do I connect my XBOX to TV? 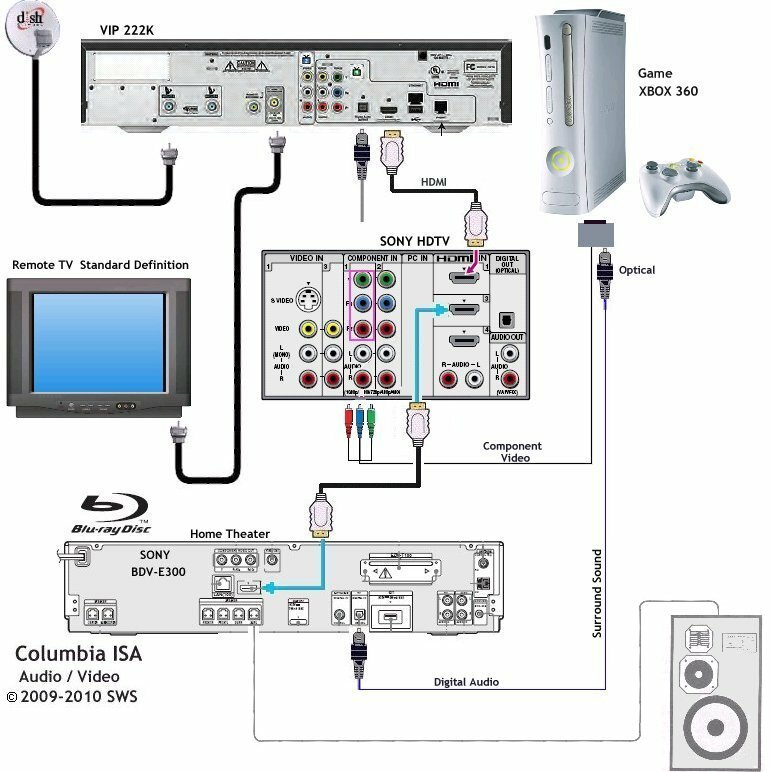 Answer: You need to buy an RF Modulator and connect the XBOX cable to the yellow, white, red on the RF Modulator and then connect a RF coaxial cable from the RF Modulator OUT TO TV to the TVs input jack. Question: How do I add wireless internet to an old XBOX? Answer: You need an active XBOX LIVE subscription and a XBOX wireless adapter to match your wireless router (802.11a/b/g/n). You need high-speed internet service. On the Xbox, the menu path is "Settings -> Network Settings -> Advanced -> Wireless -> Settings"
On the Xbox 360, the menu path is "System -> Network Settings -> Edit Settings." Set the SSID (network name) on the Xbox to match the SSID setup on your wireless router. Set network mode to infrastructure. Set the security (encryption) to match your wireless router (WPA or WEP). If there is a mismatch, you may need to change the router to WEP.